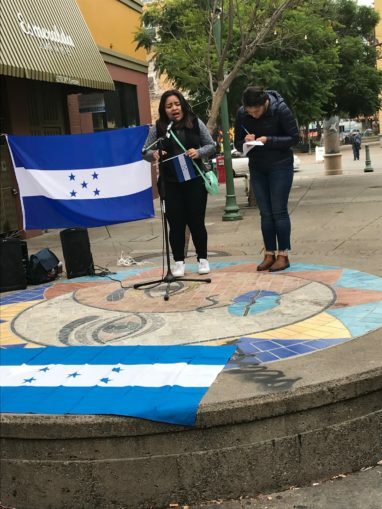 A community rally was held at Fruitvale Station in the heart of East Oakland, Calif., on Nov. 25, led by young Central American migrant activists to show solidarity with the caravan of Central American families seeking asylum in the U.S. Organized by Pueblo Sin Fronteras, today’s event was called to support the international Day of Solidarity with the migrant caravan. A major emphasis of today’s protest was Honduras and the repressive regime that has created the conditions leading migrants to seek refugee status in the U.S. Honduran flags were prominent in the crowd. Christian Pineda, a University of California-Berkeley student who received asylum in 2015, spoke about poverty, violence and corruption in his country. “More than 56 percent of the people live in poverty,” Pineda stated. “I would see dead bodies on the way to school. People are fleeing to find safety.” Pineda noted that Honduran President Juan Orlando Hernández secured re-election with the support of the U.S. and Donald Trump. Verónica Aguilar, a Salvadoran migrant who came to the U.S. last year on a similar caravan, talked about repression and violence faced by migrants in the U.S. She spent 11 months in detention and her ankle bracelet was only recently removed. “We must start collecting basic needs for people on the caravan — food and warm clothing,” Aguilar stated. She urged everyone who could to go to the U.S.-Mexico border and support migrant families. Arlette Jàcome, cofounder of Central Americans for Empowerment and a Guatemalan activist, talked about repression that the caravanistas faced when traveling through Guatemala. “The people of Guatemala supported the caravan and give them rice and food. Later, Guatemalans joined the caravan in Mexico because of extreme hunger and racism,” said Jàcome. Organizers urged everyone to attend upcoming local events to build support for the Caravanistas and their fight for political asylum.